Click through the top images from Princeton University's Art of Science Competition, which features images of artistic merit created during the course of scientific research. Worms are a source of wonder in this year's crop of aesthetically pleasing scientific images, served up by Princeton University's Art of Science Competition. "C. instagram," one of the contest's top photos, features a wriggling network of C. elegans worms on an agar plate covered with E. coli bacteria. Ewwww, right? But when Princeton molecular biology student Meredith Wright looked at the scene through a microscope, she had a different reaction: Cooool! "I found the pattern on this plate particularly lovely, and was able to capture it with my cell phone by holding the lens of my phone's camera up to the microscope eyepiece," she wrote. "I've since shared the photo on social networking sites and have had friends who've never been interested in biology ask me more about my work because of this photo." Researchers don't do what they do to create beautiful pictures, but beauty often arises amid the search for scientific truth. That's what the Art of Science program is going for: Images produced in the course of scientific research that have aesthetic merit as well. This year's theme was "Connections." Andrew Zwicker, director of science education at the Princeton Plasma Physics Laboratory, said that some of history's most exciting scientific discoveries have come from making connections between different disciplines. "For example, with physics and biology, everyday there is a new finding showing that the two are connected in the most fascinating and profound way," he said in this year's contest announcement. "In a similar vein, connecting the aesthetics of laboratory images to their scientific importance has transformed how we look at our data and results. 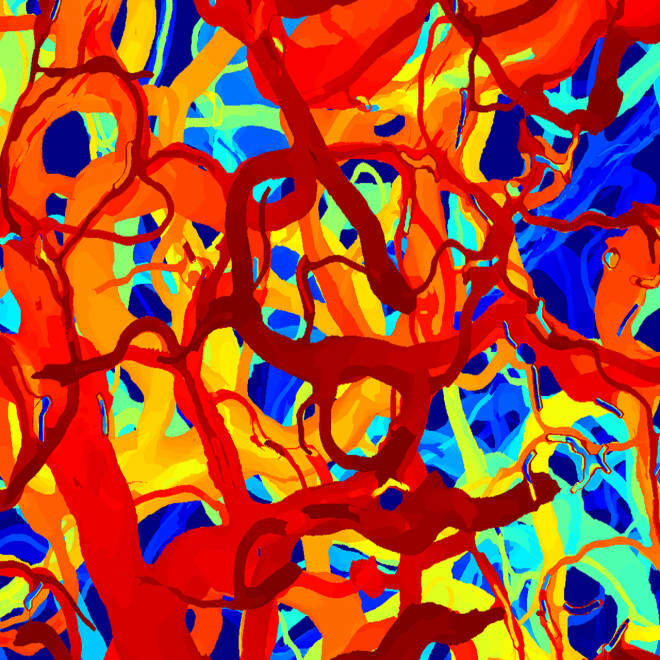 With the 2013 Art of Science competition, we are celebrating all manner of connections." "C. instagram" shows masses of C. elegans worms on an agar plate. The picture was taken with a smartphone camera through a microscope, and shared via Instagram. The connections between beauty and truth are reflected in this year's three top-rated images. First prize goes to Martin Jucker's visualization of Earth's wind patterns in shades of red and blue. Michael Kosk's photomicrograph of crushed birch wood took second place. And third prize went to a many-branching visualization of online connections for the websites set up by the plasma physics lab and by the Lewis Center for the arts. "These two embroidery-like figures visually give us an idea of the similarities and differences of a website devoted to science and one devoted to the arts," said the prize-winning webmasters, Paul Csogi and Chris Cane. The three prize-winners will share $500, divided into shares of $250, $154.51 and $95.49 in accordance with the aesthetically pleasing golden ratio. Another 40 images are included in Princeton's Art of Science 2013 exhibit, which opened on Friday in the atrium of Princeton's Friend Center. The works were chosen from 170 images submitted from 24 different departments across campus. Click through our slideshow featuring some of the pictures in the exhibit, and then be sure to visit the Art of Science website and the Art of Science Facebook page for much, much more. And don't forget to share. That's precisely what Meredith Wright hopes you'll do with "C. instagram." "This image represents the simple pleasure of finding something beautiful when you don't expect to," she wrote, "and it shows how easy it is to connect science with new audiences by simply clicking 'share.'" Alan Boyle is NBCNews.com's science editor. Connect with the Cosmic Log community by "liking" the NBC News Science Facebook page, following @b0yle on Twitter and adding the Cosmic Log page to your Google+ presence. To keep up with NBCNews.com's stories about science and space, sign up for the Tech & Science newsletter, delivered to your email in-box every weekday. You can also check out "The Case for Pluto," my book about the controversial dwarf planet and the search for new worlds.